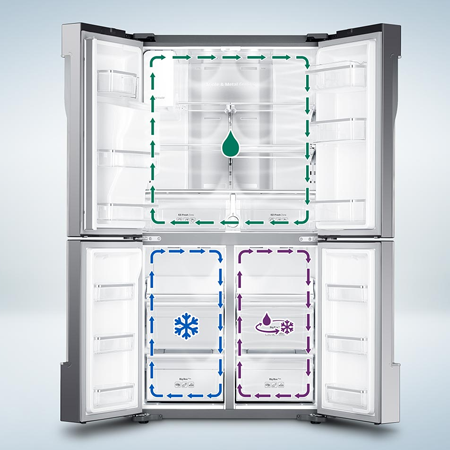 Space on demand: The Cool Select zone+ provides the ultimate in food storage flexibility, so everything stays fresher. 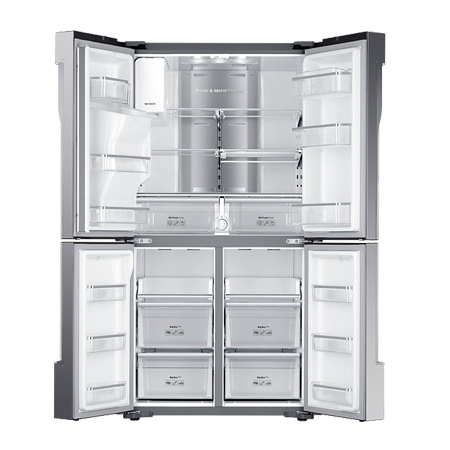 The bottom right compartment can be easily converted from a fridge to freezer with four temperature settings. 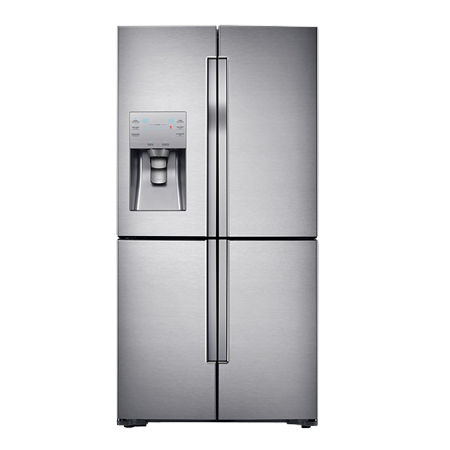 Store and see more: Has a big capacity, so theres plenty of space in the fridge and freezer to store any shape or type of food. And it has 4 doors that open out wide, so you can see everything at a glance. Revolutionary cooling: A Triple Cooling System independently controls and optimises the temperature, maximises humidity and prevents odors mixing in 3 compartment. A Metal Cooling plate also helps to keep the air cool for longer. Outstanding freshness, Kitchen harmony: The counter depth and height design blends harmoniously with your kitchen, but opens wide and makes it easier to store any food. 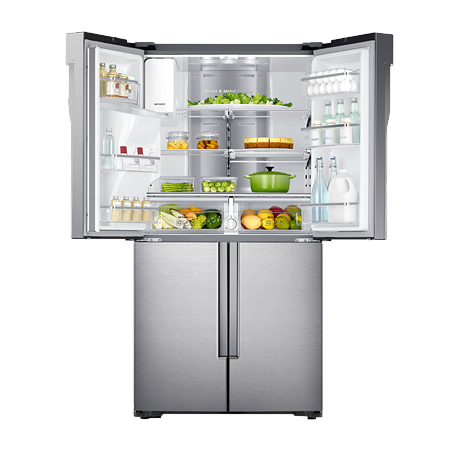 Its Triple Cooling System and flexible temperature technology also keeps food fresher. 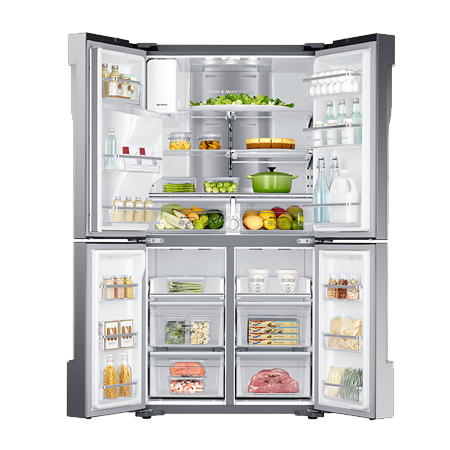 Preserve meat / fish freshness: A Chill mode in the bottom right door provides precise cooling for preserving fish, meat and poultry - keeping them at an optimum -1 °C with minimised temperature fluctuation, so they stay fresh with the best flavour and texture. Perfectly harmonious design: The stylish counter depth and height design fits seamlessly with the surface of your existing kitchen furniture for a completely harmonious look that upgrades your whole kitchen and makes your place look gorgeous. Easy to store: The Two Step Foldable Shelf slides in and out and can be folded up to create more room for larger bottles and tall or bulky containers. So you can adjust it to fit everything in and safely reach things at the back. Timelessly stylish: Has a timelessly stylish and refined look and feel that will outlast passing trends. With its contoured metal body and recessed handles it will add a real touch of professionalism to your kitchen for many years. Holds larger items: An Easy Big Door Bin lets you safely store larger items inside the door. It can handle bulky cartons of milk and juice and two rows of drinks cans and bottles. So it frees up shelf space and is great for parties. Pay an initial 10% Deposit of £219.90. A £29 settlement fee is payable at the time of final payment. Settle the balance in 12 months interest free.